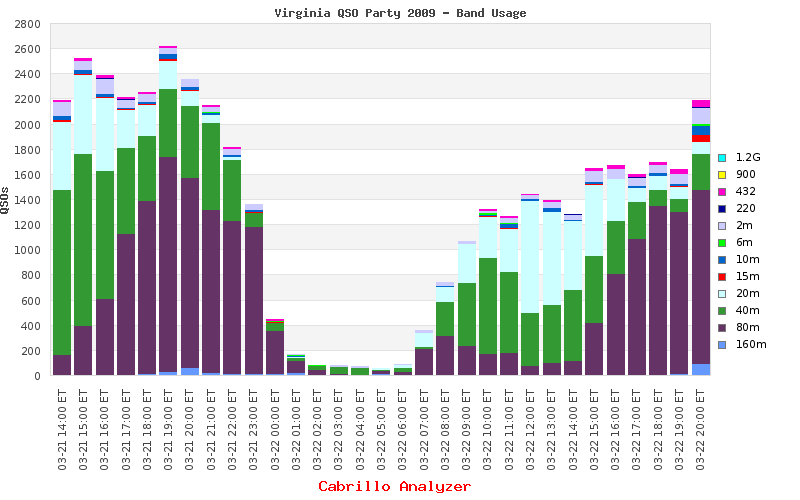 This site is not the official web site for the Virginia QSO Party. Please visit the Sterling Park ARC for information, rules and other items of interest. Find a way to move across the bands with your fellow members at some designated time. 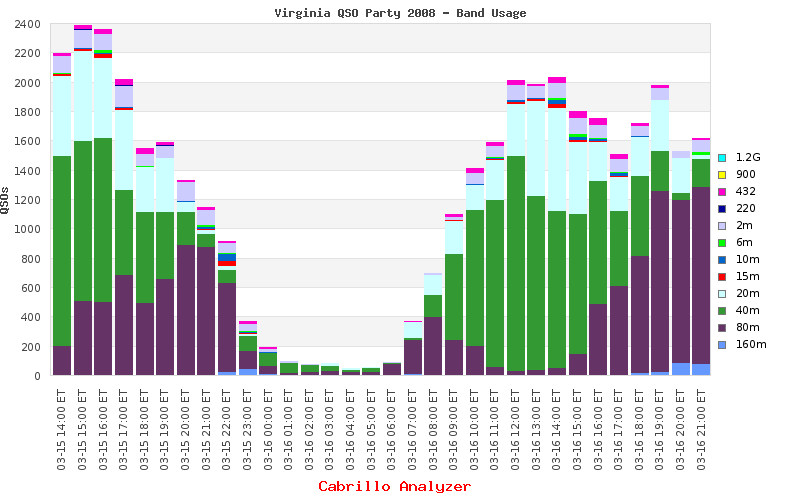 In previous years, this was a good way to make use of late night slow QSO rate periods. This year, there is no late night time so things have changed a bit. 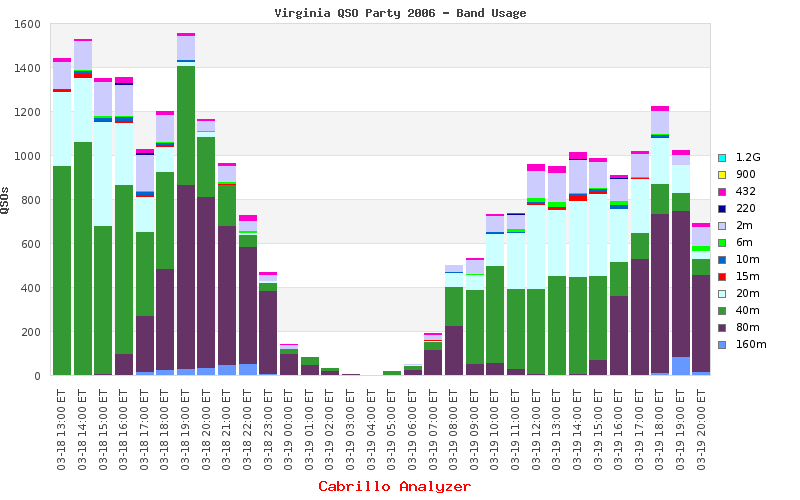 Bandhopping really builds up the points. This is especially true if one or both members are 3 point mobiles moving from county/city to county/city. Add a 220 MHz radio to the mix. While not a very popular band, radios are not too expensive these days. There is enough activity to warrant its use. As seen in the graphs below, 40m has been big the last couple of years so plan to S&P through there often. VAQP does not penalyze those who use spotting networks. If your Mobile is running HF in a rare county, spot him/her to let your fellow club members know. If you have a private spotting network use that first. After your teammates have their chance at adding the mobile to their log, then spot to the general cluster to give your mobile teammate more QSOs. The VA QSOs Only Club Plaque is specifically designed to make every QSO any club member makes valuable to the overall score. 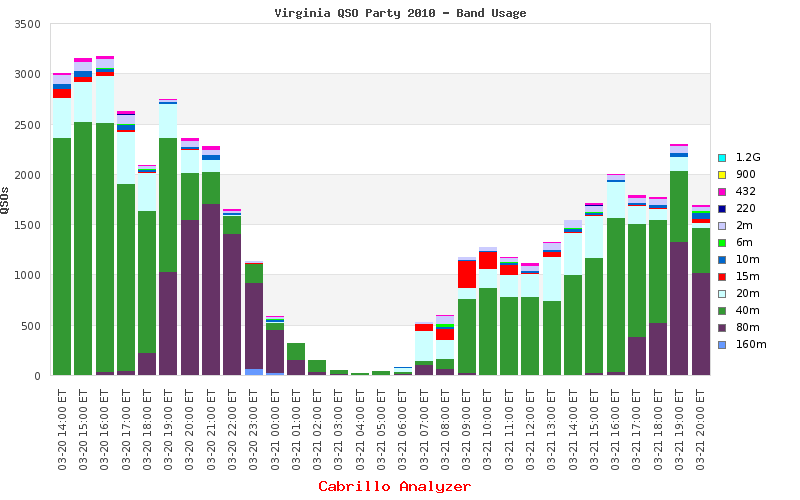 Yes, it's still true the big powerhouse stations will do very well on their own, but even one QSO from the little guys are multiplied by the overall counties/cities the club contacts... up to 134. If your club contacts, say, 80 different counties/cities during the event, and the tech makes one 2m QSO with a mobile, he/she adds 3pts * 80 = 240pts to the club score! 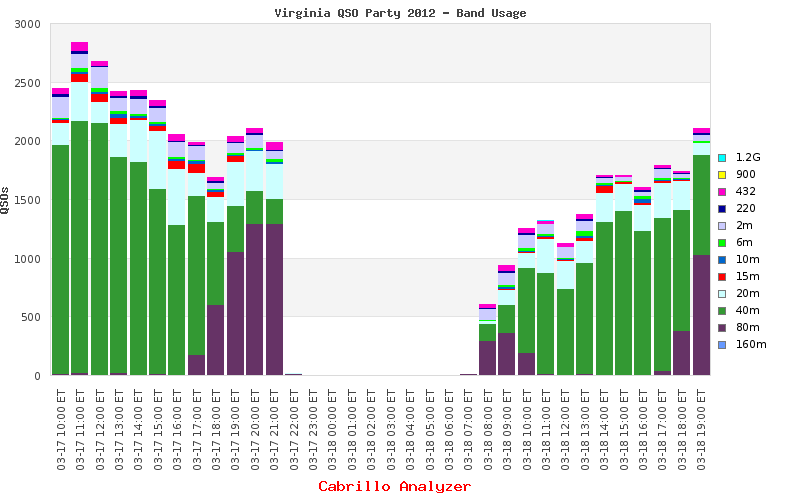 If the other mobile is your club mate, you both contribute 480 pts with just one QSO. 2m/440 contacts are a very important part of the overall score for this plaque. Get on Skyline Drive if you can. Go Techs! Remember, only in-state contacts, between two VA stations, count for this plaque. Don't let this stop you from making contacts out of state, though; They will still help your personal score. 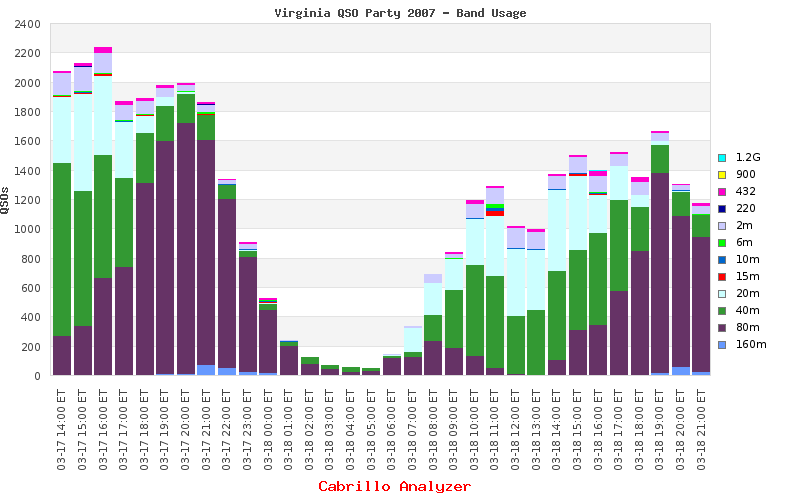 The last few years VAQP overlapped the Russian DX Contest. While many argue DX Countries should not count as multipliers, the fact is they do. They run a serial number just like us so the two are quite compatible. 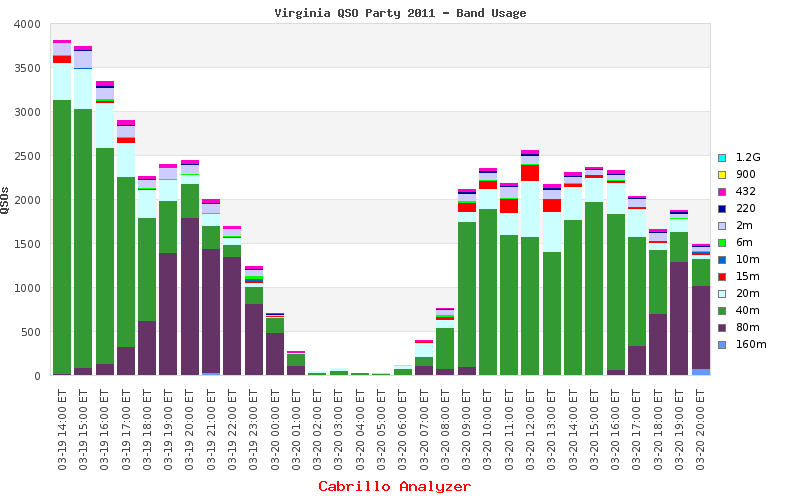 Look for rare Virginia Counties and/or Mobile 3 point contacts on your favorite DX Cluster. New Single Operator Plaque with focus on Virginia Contacts.